Nonbearing walls can be a great thing when you’re remodeling. They’re great for sectioning and organizing your house without much hassle. All you need is basic carpentry skills and the right tools for the job. 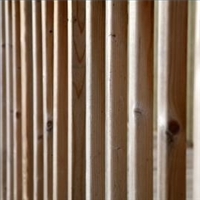 Your standard interior wall has 2-by-4 studs placed vertically between horizontal 2-by-4 top and base plates. This is the basic skeleton framework of the wall. It’s typically covered by tile backerboard and tile, lath and plaster or gypsum wallboard. Gypsum should be your default; it works well, is very affordable and it’s completely green. Mark the centerline of your wall along the ceiling. Note that in some instances you may need to remove or peel off existing surface materials to allow a more secure attachment. Measure and mark half the width of the new wall’s top plate at each end of the line. Snap a chalk line between the two new marks. Plan on having a stud at each end and measure in 15 ¼” to the edge of the next stud, then 16” for each additional stud. Lay the top and bottom plates beside each other on the floor. Measure where the wall studs will be going and mark the appropriate lines across the plates. Find the ceiling joists and hold the top plate along the guideline we marked on the ceiling earlier. Still holding the top plate, drive two 3 ½” nails through the ceiling and into each joist. If the wall you’re installing will be parallel to the joists, use nailing blocks instead of driving directly into the joists. Hang plumb bobs from both ends of the plate you just attached to the ceiling. Have them hang down so they’re just barely above the floor. Mark below where the plumb bobs you know the bottom plate’s location exactly. Mark along the floor with a chalk line to give you a better idea of where you want the bottom plate’s edge. Attach the bottom plate to the floor using 3” nails every 14-16”. Pick up some stud-framing clips from your local hardware store to install the wall studs. Set the stud into position carefully, making sure it’s flush with the edges of the top and bottom plates. Use a level to make sure it’s even and then nail it into place. If a wall intersects another, use two studs to allow for the other wall. If the wall’s going to have a corner, use two studs with wooden blocks sandwiched between in the corner area. Attach studs and the intersecting wall as normal.